The past couple of years have been filled with people occupying the streets in protest of the 1 percent versus the rest of the 99, so when I received an email from LinkedIn telling me I was for once in the exclusive top percent, I was elated – even though it had nothing to do with money. A day later, my co-worker was also congratulated by a LinkedIn email stating that she was in the top 1 percent of most viewed profiles on the site. An hour later, when I was just about to hop on Twitter to boast my ranking for everyone to see, I saw a colleague had tweeted that she was congratulated as well. It seemed like my exclusive congratulatory email wasn’t so exclusive after all. In mid-February, LinkedIn sent an email commending its top users on being in the top 1, 5 or 10 percent of viewed profiles in 2012. The proud email seemed sincere until the LA Times reported that 10 million other users got the same exact one. Since LinkedIn has a span of 200 million profiles, the elite top 1 percent email was sent to two million users alone. After receiving the email, thousands of people with LinkedIn accounts who received such high rankings ran to their favorite social networking sites like Facebook and Twitter, and proudly showed their hierarchy to the world. In fact, the email made it quite easy to do because by clicking the read more button, it brought you to a page with a lovely letter congratulating you on your success more formally and an easy share tool that allowed you to brag about your status to all your social media followers on Twitter, Facebook and of course, LinkedIn. The tactic of their marketing team seemed to have worked and suddenly countless of social media outlets and news publications were reporting on its outcome. But how did the LinkedIn marketing team know it would work so well? Sure some of the tweets were not necessarily the exact response LinkedIn was hoping for, which was written out in their easy to share tool, but regardless of the responses people were tweeting, boasting or even making fun of it across the Web. On the other hand, even though the LinkedIn marketing ploy seemed to have gotten people talking, it also left a lot of others feeling like they had been tricked. As one of the most credible social networking websites, many professionals rely on LinkedIn as a valuable tool for their marketing, business development and information gathering needs. Taking advantage of the predicted egos of its users may have been more of a risk than LinkedIn had anticipated. It did get people talking, but the congratulations also left a lot of people questioning LinkedIn’s integrity. While I think part of the marketing plan was poking fun at social media’s constant strides in making everything seem newsworthy, at the end of the day the tactic did get people talking. Some say all press is good press. Others disagree. I’d love to know if LinkedIn gained or lost members or advertisers as a result of the ploy – because what marketing is really about is measurable and quantifiable results. If their goal was to get the attention of 10 million users, then they completed their mission. Did you get a congratulatory email from LinkedIn and if so, did you share the accolades on your social networking profiles? I'd have to say this was a good move by LinkedIn. 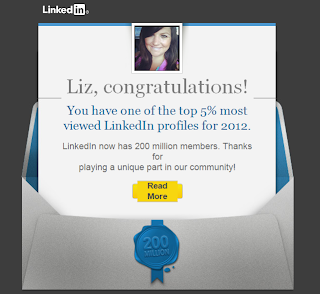 It was a smart way to catch the attention of the LinkedIn user in their inbox. Unlike other social networks, many people don't sign into LinkedIn on an every day basis so it probably brought some traffic to the site and reminded users of all that it has to offer. That's an interesting observation, Steve. Thank you for sharing it here. 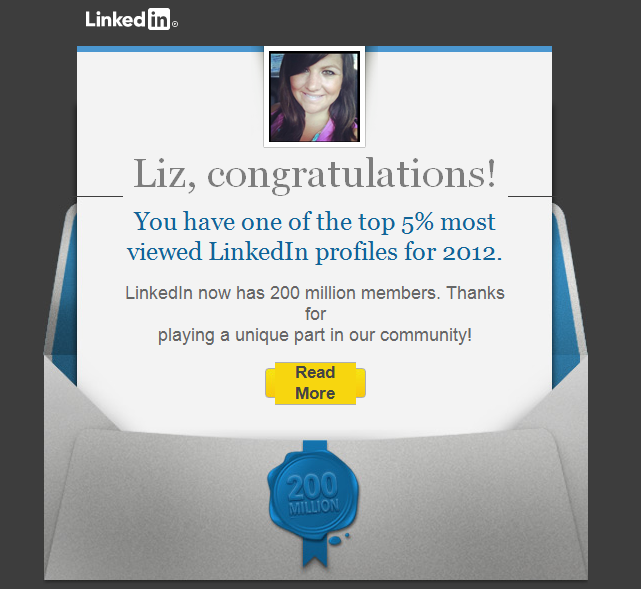 I have a friend that received an email congratulating him on being in the top 0.1%. Of course, he is a hiring manager at a major tech firm in Silicon Valley.